Attacks by the law on freedom of speech and our freedom to do business with the government have taken their toll. The actions of the past decade have stifled the growth of mid-size organizations while slowing the incorporation of new artists-run organizations. More small and mid-size organizations are folding under the paper work, long hours, poor pay, and dwindling public support. Yet at the top of the heap, the heavy administrative, low audience appeal Western European folk art forms of ballet, symphony orchestras, and chamber music are losing money at the box office while receiving more and more of the public and private funding. From where I sit, here in Atlanta, I know that 8-10 organizations receive 75 % of all public local, regional, state, and private funding. I want to know what you think about this (send email to publish@inmotionmagazine.com). All of this. From where you stand. Art changes. Notice any lately? My involvement in the Arts as an artist, teacher, activist, sponsor, and funder spans nearly twenty years. Over the years, I have served on the Board of Directors of N.A.A.O. ( National Association of Artists Organization) representing the southeast region -- responsible for organizing a regional gathering in between the National Conference held every eighteen months. N.A.A.O. took the lead in the early '80s when the first salvos in this cultural war were sounded. We filed friend-of-the-court briefs on behalf of artists and arts organizations under attack by Helms, Wildmoon, and the forces of the Moral Majority. I have helped to found and stabilize an inner city community-based arts facility in Atlanta and participated in the drafting of arts policy which resulted in the creation of the citywide Materials for the Arts Program. I have served as a panelist, program reviewer, and policy evaluator for the National Endowment for the Arts (NEA) Expansion Arts Program, Inter Arts Program (in it's many reincarnations) and as panelist for the States Program. I had the pleasure of serving on the theater fellowship peer review panel convened to re-evaluate (and reinstate) the applications of the NEA Four after Frohmeyer refused to accept the panel's recommendation for funding. My work has allowed me to examine and review many unique programs deeply rooted in and reflective of America's multiethnic and multicultural populations. My experience and knowledge has been enhanced by my membership and service on the executive committee of Alternate ROOTS, an artist-run eleven-state service organization that pioneered the contemporary notion of community-based work in the South. As administrator and visionary for the New Forms Arts Initiative in the South, I raised new funds and leveraged local support to increase the funds available for artists working to, "conceive and create new traditions of art in unusual places." This national program was organized into thirteen regions and was a public/private partnership between the NEA and the Rockefeller Foundation (later the Andy Warhol Foundation joined the partnership). In my region -- Georgia, North and South Carolina, Tennessee and Alabama -- the New Forms Arts Initiative encouraged interdisciplinary work and work not receiving funding from other sources. From where I stand I have learned ... Art Changes. 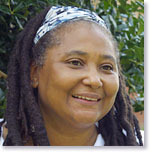 2002 -- Project South, an applied research institute for the elimination of poverty and genocide, honored Alice with their Spirit of the Movement award for using her poetry to promote and support human rights efforts in the South. 2001 -- Alice Lovelace accepted the position of director of the Atlanta Partnership for Arts in Learning. 1997 -- Alice Lovelace was awarded the Fund for Southern Communities' Torchbearer Award for consistent contribution to the movement for social justice.